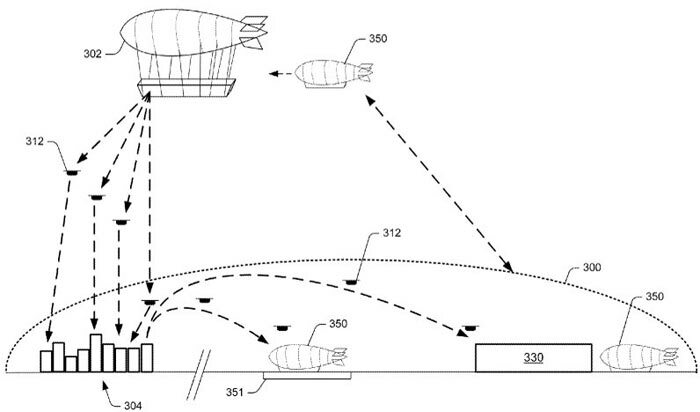 An interesting Amazon distribution chain patent has just come to light. The patent details the deployment and use of an aerial fulfilment centre (AFC) and unmanned aerial vehicles (UAV) to facilitate fast and efficient delivery of Amazon sold goods. The AFC is basically a large airship or dirigible which can carry a good amount of stock to be delivered by an accompanying drone fleet. Meanwhile smaller shuttle airships will replenish the sizable AFC. As reported by TechCrunch, Amazon is likely to position its AFCs where it predicts spikes in demand. Thus it can leverage a large local warehouse presence for the best delivery efficiency without the time and expense required to set up a bricks and mortar warehouse on the ground. An example of AFC deployment provided in the patents suggests the airship could be flown to a sporting event venue and loaded with snacks, souvenirs and so on. Also, possibly at the same time, the AFC could descend from its default altitude of 45,000 feet (out of the flight paths of other aircraft) to an 'advertising altitude' much lower to the ground where the public and see (and possibly hear) the airship. At this lower altitude the AFC could broadcast images and information about sales and offers. On the other side of the equation, customers might identify their particular UAV deliveries by "a flashing light, smoke or other visual identifier," notes Amazon. In a smart IoT manner, the drones and airships will be able to communicate with each other regarding things like weather conditions, wind speeds, stock levels, and so on. At this stage all we know is that Amazon is considering such an AFC and UAV network tied into its terrestrial operations. How far off this might be in practice isn't known, and Amazon hasn't responded to enquiries about this airborne warehouse system as yet. If this happens then it's only a matter of time before you HAVE to have a paid for licence to fly ANY drone. It's ALL about the $$$$$. why complain about that? Surely you don't expect to be able to fly a drone for free do you?